​The musicians could have simply run the bath water, we wouldn’t know there was anything else, not these architectures carved out of the mountain, these spaces opening before our ears. A hard, mineral clarity pulls light into the malleable mass of sound that lies dormant around us, as if to reveal the hidden face of the sentient world we inhabit; there to be played, brought forth. We will not quite recognize what we are called to witness, just that it is an alert music, ever mindful where the mining goes. But how do the musicians know how to proceed, to trust that together they will manage to find a kind of harmony, a collective intuition in their noise harvesting? We’re not talking song and dance, or some other script that tells everyone where to follow. It may be that only our uncertainties light the way here. The materiality of this music makes for a marvelous garden. As if objects and environments stood in for elaborate lattices of notation. But then, there are hardly notes. We hear the metal and the wire and the coil of the electric guitar strings, how they ring and glisten and burn, sometimes like horns screeching; the bowed and plucked voicing of the wood in the bass, the quickness of sticks, the scratches on the spinning record, and all the fine frenzy and spark of electronic instruments. Such variable densities, and such drama at every turn. Even the shapes of the pieces unfolding surprise us, we weren’t aware the landscape could change so. What is about to happen is already happening, and our ability to see will soon catch up. ​This is music that listens—to the connections, the resonances between things, between states of being. More than a dialogue on piano with one of the great masterworks of the classical music canon, it poses rather a reflection on the self, past and present lives, the arduous paths to the current moment and where one has gone with them. A very personal record, in which The Goldberg Variations opens many doors. Each piece begins with a fragment from Bach’s jeweled marvel, but those idyllic shards come to us as in a fitful dream, fading in and out across some distance or through a mirror, by way of obstacles and snags, as another voice, other hands, weave their light-infused commentaries upon, out of, beyond the primary strands. Paula Shocron, in Los vínculos, has found a way to inhabit her ghosts, as it were; she brings us to a realm that is at once familiar yet always unexpected, continually finding new life. ​Certain music, one has to go very far inside to bring forth. If venturing alone, more perilous still—so much space to inhabit, so much silence to dance with. Easier to just get lost, or fall back on old expectations, than to keep the music fearless. Of course, there is also a kind of patience involved. Nothing is achieved entirely in one day; nor in many days, for memory has to draw its nests. You cannot know what you’ll come up with, but that is how you find it. House in the mountains. Family’s gone out. Each afternoon like this, shut yourself in a room. Go to the well. A person in such pursuits will get lost a little anyway, so it helps to have a guide. Or to say: after decades playing and recording in various formations, Giancarlo Locatelli went up a mountain and came back down with his first solo record, all under the star of Steve Lacy. Naturally Nino was long familiar with the Lacy way of thinking and with Lacy tunes, with Lacy spirit and Lacy sound, and if he, Nino, was determined with his clarinet to take the plunge, what more inviting vehicle could he have chosen than those marvelously acrobatic and deliciously oblique Lacy lines? The plunge, I mean, as in the solo of the solo where you’re smack against the question of what’s next, when you’ve taken leave of the melody and there’s really nothing under you. Lacy’s tunes are devised with a rigorous affection, they engage instantly and seem ever unique, but their challenge is not for the faint of heart. Each piece frames an opening to inquiry and experiment, to meditation and humor; to scope out the furthest parameters of sound. We get all this and more in Nino’s performances, which also attests to the quality of the material. By now, at least a dozen groups and individuals have made a project of playing Lacy’s music, and the remarkable thing is how distinctive everyone turns out to be—as if, through the Lacy lens, every musician becomes more themself. But Nino makes the enterprise especially personal. Beyond the circumstances of the recording, it’s clear that he worked a long time on these tunes, getting familiar with them inside and out, careful not to record too soon. Exploring this music alone, unencumbered, was a way to get the most out of it. That shows even in his treatment of the melodies, which are rendered more meaningful by the familiarity and nuance. He fully situates Lacy in the tonal palette of the clarinet, and at moments seems to be playing breath itself. Such is the tension between wind and wood that sometimes, taking a further turn, he transmutes his instrument until it’s sounding like a shakuhachi. Lacy would have appreciated the magic and the reference. Another affinity they share regards their attention to words’ work. How words sculpt meaning, how they color a phrase, how the phrase may be sung, and the melody played as if sung. Most of these tunes Lacy wrote to poems and texts, which thus dictated the form. Nino worked with two poets who were friends and collaborators of Lacy: Franco Beltrametti and Tom Raworth. This set includes the two songs Lacy wrote from Raworth poems. The lovely “Absence”—Nino opens the window to let in the cowbell and crickets—was a poem written in memory of Beltrametti, while “Situations” here implicitly invokes another absence, Lacy, who never recorded his song. ​Who could have made such music? What was he thinking? Or rather, what were his fingers telling him with their ecstatic stuttering, their motormouth metalanguage? And do you call this music? It does not sound like noise. In its skittering, scampering, blurting of pure expression, it is alive, unmistakably alive. Like a creature we don’t quite recognize, that moves by its own lights, that does not need our permission to exist, that finds or makes its own spaces and habitats. Music is always abstract, so it would seem a redundancy to think of this as abstract music. Of course, we do not consider songs abstract, nor familiar melodies or classical forms—even when we are aware that what seems familiar is really a matter of cultural habits and slowly developed norms (which are themselves constantly changing, naturally). This music, this splash of tonalities and textures, this breathing of illuminations in their flurries of flight, might well be an abstraction of the seemingly-non-abstract. Quickest glimpse of a melody from afar, so far that it must be foreign, though no less human for that; and so quick, so speeded up perhaps, that we do not know what we are haring. The spine of a massive animal poking up through a surface we did not even realize was there. Alan Sondheim is a polymath, a restless connecter, explorer of virtual realms, tinkerer in the currency of questions, ever curious about impossible articulations of the body, of bodies, of dust and stars. Or what had seemed impossible. Luke Damrosch, meanwhile, tracks the flickering web of Alan’s spells, catches their reflections, follows them through to their secret heartbeat. And Azure Carter? Azure assures him, ensures the voice within the music, soft anchor to a wild ear, filters the wind of vast expanses into a sigh, a melodic speaking, we are here, we were here, we may be somewhere else tomorrow. Music in the interstices; bloodstream level, slow flow and constant variation. It’s not the toys that render the music but rather the chemist, the chef, who sees their talents and knows what to do with them to uncover something worth hearing. He recasts the already played or playing through otherworldly processes, tapping ghost voices hidden inside the wood. So that when he lays out phrases from his horn, he is also hearing where they might go; the elasticity of their sound potential. Colors here have been opened and refracted; the melodic gesture taken to baroque, prismatic lengths. A cup of something strong to fortify you for the night’s journey. We cannot know quite how old the gesture of song may be. There are no prehistoric equivalents to rock art and cave paintings with regard to the animating world of sound, only remnants of simple instruments, but none of the voice or its impulse to light our way through the vast unknown. Song gets us through the dark, steadies us amid raging uncertainty, pulls us along in its wake to a glimmer of trust—that the song will continue, that we won’t fall into a trap or a precipice by following its allure. Like sticks or flint to make a fire, the elements to spark a song are simple and few. Voice cast into the air as words, or a whistled or wordless figure, the phrase vanishing almost as quickly as it appeared, mere sound, nothing at all—buoyed only by memory and another breath carrying a new phrase, repetition perhaps that yet implies some small development, positing a nascent rhythm, a certain shape and tone, a play of expectations. Where they go, these phrases, is anyone’s guess, just as it is for their maker who draws on a kind of inner momentum, a feel for where they want to go. Traditional song forms, as with dance tunes and verse itself, helped contain the measureless possibilities within a reliable set of limits. In the modern era, jazz drew on such forms as familiar language yet in doing so, questioned the terms. What had once seemed limits turned into a scaffolding for adventure, an invitation to go beyond. Playful by nature, jazz in its rapid evolution always sought an opening until eventually the scaffolding fell apart or was re-imagined. One principle implicit from the start, obscured by art’s lofty sights, had to be learned anew by each generation of practitioners: that any figure of sound can be a point of entry into music. Jazz, claiming the freedom to mix, freedom of association, offers a complementary perspective with its instinct to undermine fixed boundaries. So, for those prepared in their unknowing, the task becomes one of finding just what the music may hold. And to get anywhere in such pursuit, they must trust in each other. That is what these musicians have done, elaborating songs they did not know before. They had played together many times, so Ramuntcho recognized an opportunity. He gave them few indications of what to play, to see what might happen. Sometimes he had a full sketch of a song in mind; others, he knew little more than them when they began. Building on a sequence of guitar chords, or a bass line, or the merest bend of words, they improvised a form from inside the song. The trick was: they didn’t know the tapes were rolling. Which meant mistakes were not mistakes, just a step to something else; another method for courting chance. But Ramuntcho knew they were recording, and he knew what they had. He was able to hear the music with an other ear. The funny thing is, the more I listened, the more I became convinced I had got it wrong, that there must have been a lot of rehearsing. He tells me none at all. I still wonder if he was pulling my leg. ​Each translation is like a bridge thrown up so that some might pass over and others come to meet us. To attempt to carry a poem across is surely a little crazy—who knows if the goat under our arm will still look like a goat when it sets its feet down again? But if the leap from one language to another is an act of faith—and much labor—it is also an apprenticeship in listening. So the leap into music for a poem is to court the risks of any translation, and to pledge another faithfulness besides: simply, that the poem not be diminished, nor the music, by their encounter. The stakes are high enough, then, in setting texts to music. The two composers on Crosswords / Mots croisés add another fold to the challenge: they set the same four poems to music—two written in English and two in French, with translations of each into the other tongue. The songs, of course, are not the same; and yet there is a family resemblance, in the paired readings, that seems unmistakable. How does that happen? The distinctive genetics of a poem, perhaps roughed up a little, do indeed survive translation. Naturally, it helps to make interesting choices for source material, the grain from which the songs will spring. American saxophonist Sam Sadigursky has been cultivating his eye and ear in that regard for a while now, having recorded four discs in his ongoing Words Project series (Words Project IV made with the same band as on the current recording, during the same several days of sessions in the south of France, sigh); across a range of poetic registers often tinged with imminence, his settings reflect a resourceful use of voices and voicings, musical textures, tone. This time, he has proposed a slight variation on that enterprise, in collaborating with the versatile French pianist Laurent Coq, who helps so much to shape the pieces with his marvelous touch and extensive palette. One might say the two composers show impeccable taste in choosing these succinct, sublime poems by Blaise Cendrars, William Carlos Williams, D. H. Lawrence, and Eugène Guillevic, texts that resonate well beyond their small number of words. The melodies devised for the poems are supple and full of light, carried aloft by the singers Christine Correa, on the English-language songs, and Laurence Allison, on the French (the full sextet—with Yoni Zelnik, bass, and Karl Jannuska, drums—plays together only on “Dreams,” composed by Sam from Muriel Rukeyser’s poem, the two voices braided like a double haunting). Remarkably, the composers manage to respect the formal contours and irregularities of the verse, in their attention to line and line break and even rhyme, while also taking liberties where they please. The songs thus achieve their own complex musical integrity. Can I discern a clear difference in styles? At moments, I thought I could. Laurent seems to lay out his phrasing in a more horizontal way, like a landscape that evolves before your eyes, whereas Sam tends toward juxtapositions of pitch and interval, along a more vertical axis, as it were; but I listen to another song and that distinction dissolves. Or what seems like an inclination to savor the words in small clusters, on the part of Christine, in contrast to a more drawn out line, an instinct for implications of narrative in Laurence’s approach; but here too, it may be the contrary on another piece. Rather, the musicians have permeated each other enough that they render a cohesive sound, no matter the composer or the language, in which no one personality dominates the unfolding dynamic of a piece. About those liberties. Sometimes it is a matter of repeating a few lines, almost like a refrain, but more for the purpose of opening up the tune to further depths or detours, as if the song were leading the lyric to reflect upon itself. But there are also embellishments in the spirit of the poem that carry a unique charge: in the middle of Cendrars’s “Aux Cinq Coins,” for instance, the most sensual of the texts, a single line stands on its own like a dramatic summation, “Et je tombe translucide dans la rue” (Translucent I fall down in the street); Laurent and Laurence half-repeat that line, “Et je tombe translucide / et je tombe translucide dans la rue,” thereby granting a truer dimension to the revelation and wonder it evokes. If there was a puzzle here for the musicians to solve, it was to divine the movement in the words, the gestures and colors and smells launched forth in the breathing of those words. Such is their achievement: to have discovered the wider shore promised by each poem, and to have built a vessel to take us there. In the late 1980s, at the start of his uncompromising career, Ivo Perelman embarked on a projected trilogy of music based on Brazilian children’s songs. His debut album, Ivo, was inspired by Euro-Brazilian melodies, while the second, Children of Ibeji, in 1992, explored African influences. Both records featured top-notch ensembles where American jazz combined with Afro-Brazilian rhythms in daring new ways, enabling the raw power of the music to pour forth in all its full-throttled beauty. The third part of his trilogy, however, the Amerindian strand in Brazilian culture, proved more elusive. Despite his efforts, he could not really find much of children's songs among Brazil’s Indians. Other opportunities arose in the meantime, which might perhaps be seen as a detour from his original project, but which led as though by measured steps to his latest album, Tapeba Songs. One of his many ardent admirers, the distinguished composer Gunther Schuller, invited him to record Man of the Forest in 1994, based on motifs by Heitor Villa-Lobos, whom Ivo had studied in his youth. His spirited adaptations, transformed through the prism of another cutting-edge ensemble of American and Brazilian musicians, seemed at once to open hidden passageways and yet in feeling to return the music to its roots. Later that year, in Brazil during the World Cup soccer games, he recorded Soccer Land, improvised duets with drummer José Eduardo Nazário. Ivo’s recent tendency has been toward smaller groups, allowing for greater intensity. Conceived as a sort of musical map of Brazil, the music was based on traditional songs and generated by different regional rhythms; it became the first release on his own Ibeji Records. Still, Ivo was determined to complete his trilogy. Early in 1995 he traveled to Fortaleza, capital of the northeastern state of Ceará, where he met Maria Amélia Leite of the Missão Tremenbe. Volunteers at the mission work to help the Tapeba people protect their rights and defend their land against the onslaught of big business interests. The Tapeba, a subgroup of the Tremenbe Indians, inhabit the Almofala-Varjota regions; they live from fishing and are self-sufficient. Maria brought three Tapeba children to the city, all around twelve years old. There, in the studio, they sang for Ivo some of their people’s ritual songs. The Tapeba language, derived from the Jê linguistic group and related to Tupi, is essentially a dying tongue. The children, who knew where the songs fit in the rituals, did not know the meaning of the words. Only the elders can translate them, but they do not speak the language. The ritual, or toré, is accompanied by a circular dance, performed between September and December; while the people dance and sing the chants, they drink a fermented cashew juice, mocororo, which they consider sacred and use only at this time. It was not till long after the music was recorded that Ivo spoke with an elder, by phone from New York, who explained a bit about each song. Thus, Ivo’s adaptations were solely a musical response, he did not try to read into the meanings. The melodic hooks played at the beginning of each piece are exactly as he heard them sung. He gives an indication of his method on the piece “Agua de Manim,” where one of the children, Luciana, sings the melody alone and then, after an introduction from the guitar, Ivo’s tenor saxophone repeats the theme before developing it. Much like in Soccer Land, the new record (also for Ibeji) bears witness to a cross-pollination of musical forces that may not be evident to the non-Brazilian. The drummer is again José, who previously worked with Brazilian jazz dervish Hermeto Pascoal among others and has made an extensive study of the old rhythms. So he is well equipped to match Ivo’s energetic approach to the Tapeba melodies, with rhythms from all over Brazil. The first piece, for instance, “Biju,” whose title refers to the dried manioc that is a staple of the Tapeba diet, employs a hybrid rhythm with elements of the driving dance-oriented baião from the Northeast. Here the theme is introduced first by José’s brother Lelo on piano, who played with Hermeto’s early bands in São Paulo, joined by Ivo and José who keep repeating the theme with increasing fervor till they explode; particularly impressive is the way in which, out of a simple phrase, they can unfold such different implications, Ivo homing in with a spiraling laser-like obsession, while Lelo expands it spatially and harmonically. On “Sara Mussara,” by contrast, which is a duet between saxophone and drums, Ivo opens the dialogue in a spacious pointillist manner of squeals and brief phrases—the song, incidentally, is a chant for ants (sara) —till the drums break into a march-like frevo rhythm, from the state of Pernambuco, and Ivo goes hurtling into the theme. The march soon grows more and more ecstatic, and when they eventually return to the theme it moves back out toward that sense of spaciousness again. “Napurana,” the name of a high-flying vulture-like bird, begins with Ivo in a romantic mood, accompanied by piano. As he gains momentum in the theme, the drums fire up the pace with an authentic rhythm from Bahia made famous by the percussion group Olodum—José, in fact, overdubs himself on percussion to gain some of that rhythmic complexity. From there the piece goes rocking with an infectious melodic bent that echoes the chant and dance of what could be Indian or African. The hybrid rhythm of the drums propels “Nere Nembu” from the start, suggesting the theme well before it appears on the horn. The title refers to another bird common to the area, which mostly stays on the ground and likes to bathe in the sand. Here the lovely turns of the melody hang like so many arcs in the sky, ever expanding outward through Ivo’s impassioned flights. But it is the drums that ground the piece, and even when José lays out during the sparser moments of the piano solo, the rhythm seems to be lying just below the surface. “Agua De Manim,” whose title mixes Portuguese (água, or water) with Tapeba (manim, from manipuera or tapioca), marks a change of instrumentation and tone. On this lush and reflective ballad, not only does José switch to percussion for the rest of the songs, but keyboard is replaced by guitar. Paulo Bellinati, who enjoys a full career as a classical guitarist (among his records, he has interpreted the music of the Brazilian composer Garoto), shows his mastery and sensitivity as an improviser here. The main challenge on “Brandin” was how to retain and yet enlarge the format of the samba. The title is the Tapeba word for shrimp: in the dance that accompanies this chant, the dancers walk backwards, presumably like shrimp. This piece is quite remarkable for the resourcefulness of all three players. The four-string guitar known as the cavaquinho has never been heard like it is here in Paulo's non-idiomatic approach. After his glimmering unhurried introduction, his fast strumming signals the entrance of the percussion, in an authentic urban samba rhythm from southern Brazil. In this case, José has recorded half a dozen overdubs, including drums, to produce a one-man school of samba. The first part of the samba, where Ivo conveys the Tapeba chant already with great gusto, sounds almost straightforward, but then they take it on out with such abandon that it ends up feeling like an entire night of samba at Carnaval concentrated into seven and a half minutes! The only entirely original piece on this date, spontaneously composed in the studio, “Viola” is the name of the ten-string guitar (five double-strings) played by Paulo. Ivo begins in the low register, luxuriating briefly in the full range of the tenor, before the viola comes in with its full-bodied sound and provides a traditional-style introduction. Over an authentic pagode de viola dance rhythm, from the countryside of São Paulo and Minas Gerais, Paulo then explores new ways of playing the viola as Ivo rocks along through melodic variations that sound as if they could be traditional. The haunting “Inde Cunan” closes the album with an Indian-type chanting rhythm over a bass ostinato played by Rodolfo Stroeter, in which Ivo’s plaintive throaty tenor is no longer partying but rather engaged in remembrance and prayer. It is a strange coincidence, since he did not know it when he first heard this song, that it tells of the coming of the enslaved Africans back in the sixteenth century. Though Tapeba Songs did not in the end treat specifically children’s songs, as the completion of his trilogy, the connection is there nonetheless. Through the Tapeba children who brought him these songs, the light from the past has been carried to the future. And just as Children of Ibeji was dedicated to the street children of the favelas, who are daily murdered by paramilitary squads, it is Ivo’s hope that Tapeba Songs will bring some further awareness of the fragile survival of the Tapeba and other indigenous peoples of Brazil. Fred Frith, the British guitarist, has had a distinguished career as a music provocateur. From the seminal art-rock band of the 1970s, Henry Cow, to his more recent work in such groups as Skeleton Crew, he has shown himself to be deeply irreverent of musical boundaries, achieving a wild synthesis of widely divergent elements. In his three pieces for Rova he manages to remind us that the avant-garde may really be just the flip side of the traditional. “Long On Logic” shows the most dramatic contrasts of texture. With its suspenseful tenor intro and its two fiery baritone solos, the piece bears a rich lyrical impulse throughout, from its recurring church-like harmonies to the pointillistic melodies where the group, using the African hocket style, floats the tune note by note around the four horns. California guitarist Henry Kaiser is a longtime collaborator of both Rova and Frith, his improvisations forming a fantastic blend of idioms. “Sugagaki (for Conlon)” has been recorded twice by Kaiser himself, the last time with Russian pianist Sergey Kuryokhin. The title is Japanese for “rhythm study,” which Conlon Nancarrow called his many pieces for player piano. Dealing with energy and rhythmic complexity, “Sugagaki” approaches the amazing dexterity of Nancarrow’s pieces with its bold layering of melodic patterns. It’s a wonder the quartet holds on so well, but then they are used to such challenges in their own compositions. In “torque” (on CD), dedicated to Roscoe Mitchell, the “comprovisation” is made up of trios and unaccompanied solos, cued by whichever player is currently laying out. Once past the difficult head, and its attendant lyric contrasts, the piece moves into a quick juxtaposition of ideas bent along by the pull of new elements. The main section follows a process of “additive improvising,” where three simultaneous solos are at work rather than a single trio. This gives way to the last head and its closing cascades. Lacy’s sculptural sense helps to highlight each musician, clearest in the duets with members of the rhythm section. Jean-Jacques Avenel, whose forceful bass playing stitches the band together, switches to the sansa (thumb piano) on “Clichés,” the band’s African postcard. As he does elsewhere with the bass, he sets the tune in motion, working around it, delimiting the terrain, shaping tension and texture. Last recorded by Lacy’s septet five years earlier, the duo shows that like the rest of the group they know how to derive from the sparest elements the greatest fullness. Oliver Johnson’s articulate drumming, ever fertile with its precise shadings, teams with Lacy in a densely energized performance on “The Breath.” Johnson is subtle as a rushing stream, focusing all attention on the onwardness of the playing, filling out the space around Lacy’s charging horn, accenting it. The remaining member of the sextet, Irène Aebi, marks her only appearance on the closing tune. Since the late 1960s, she has usually been the human voice in Lacy’s band. “With her,” he says, “I’m capable of bringing words into the instrumental voices.” Here it is her violin that is heard, weaving about through the tapestry. It might be said she is represented in another way on this date, in parts of Lacy’s own playing on “Clichés,” originally with Aebi singing lyrics. A breadth of vision, a certain spaciousness, characterizes Lacy’s music. One could say he has become thoroughly international after more than twenty years living abroad, but it is not simply a question of borders. The improvisor’s art consists in making space where before there was none, in drawing a window where you didn’t even know was a house. 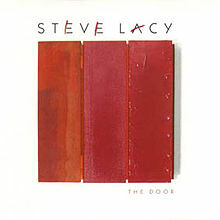 As if he has taken the freedoms of the 1960s and compressed them into every quirky tune he writes, in fact mostly they are songs, Lacy’s simple structures allow him to go way outside. And just when you think the musicians may have lost you there goes the tune again. “The Gleam” sings of what’s inside. Previously recorded by the sextet, it is a song celebrating drink and good company based on an old Chinese poem. The harmonic framing of Jean-Jacques Avenel’s bass lines casts a rich tension in the music. As a moving ground to the melodies or springing as a foil to Lacy’s leads, he likes the big fat lows of the bass. Lacy’s tone on soprano is often quite rounded, especially on the songs where he seems to hear the voice that sings the words. “Retreat” has also been recorded as a song, by his septet, and concerns not a shrinking back but rather a departure toward a place of peaceful light.